Here it is - two recaps in one post. On Saturday, Pitt pulled away to beat a hot-shooting Notre Dame team. I expected ND to be angry having lost a few in a row, but they came out guns blazing hitting threes all over the place. 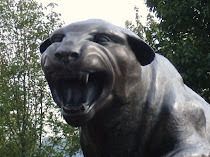 Fortunately, their shooting cooled off and Pitt had a strong second half to win 93-80. Blair had a monster game with 23 points and a career-best 22 boards. This will upset some, but Harangody, to me, is still the best in the Big East. He ended up with 27 and 11 and seems to avoid the personal fouls that Blair sometimes gets. He's averaging an amazing 25 ppg and really is in the same boat with Blair as far as NBA prospects go due to his size. In any event, he's a tremendous player. Onto the Robert Morris game. This was a great day for me and some friends who had upper level seats and because we were late (and the Zoo was not filled) were asked by an usher to move down to six rows from the court. Needless to say, we didn't have to think twice...even as 30-year olds. 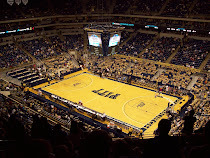 By the time we arrived halfway through the first half, Pitt started pulling away and won comfortably 92-72. On a side note, Ashton Gibbs is really coming into his own. I almost feel comfortable with him starting next year, which will likely do (along with Dixon, Brown, Dante Taylor, and Blair assuming he's back). He is probably our best three-point shooter and looks extremely comfortable out there as a freshman.